Sauber's progress in the 2018 Formula 1 season has been impressive, especially as it initially seemed to be a team that might struggle with a new and complex car. But as the season has progressed, it has turned its Ferrari-powered design into a points-grabbing car that has allowed Charles Leclerc to earn the headlines. Right out of the box the C37 looked like a very interesting car, a world apart from its predecessors - which could have been considered a little boring in comparison. Increasing complexity always brings extra risk, as it can make it harder to unlock a car's full potential. The switch to a current Ferrari engine, after Sauber used a year-old one in 2017 for cost and design stability reasons, has brought plenty of rewards. The quirky multi-inlet airbox design was retained for 2018 and, while it may not offer the best pound-for-pound aerodynamic benefit, it clearly helps the lower budget outfit operate the Ferrari power unit somewhere near its full potential. The engine, aerodynamic and budgetary trade-off for a team in Sauber's position extends outward to its sidepod solution too, which unlike many in the field doesn't feature the low-slung side impact protection spar that cleverly alters the aerodynamic sensitivity of the region. 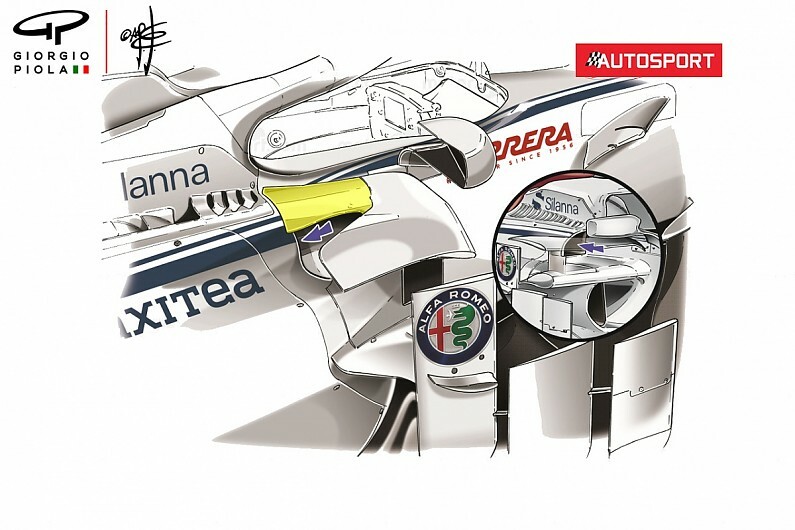 Sauber had clearly looked at the solution but took a lateral approach, narrowing the main inlet as much as possible, meaning the spar is now wrapped within a winglet, and assisting it with another more rearward-placed inlet atop the sidepod. With the relative freedom of the regulations in this region, the team's lateral thinking takes advantage of the aerodynamic gains available, without the budgetary concerns of having to meet the more awkward side impact criteria created when using the low-slung design first championed by Ferrari. After a few races Sauber clearly realised that the small rearward inlet wasn't living up to its full potential and incorporated an additional panel that bridged it and the leading edge slat in front of it (highlighted in yellow). Having introduced a blown axle at the front of the car and made modifications to its diffuser in Monaco (arrowed), the team looked to press home its newfound position in the points-scoring ranks in France with changes to its front brake duct, the splitter extension and the leading edge of the floor. 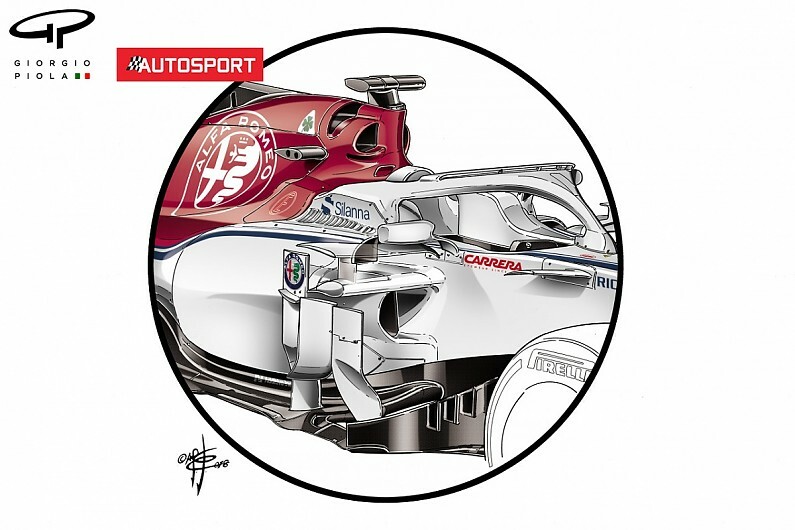 Sauber has already been pretty innovative in this region of the car, taking advantage of the displaced upper wishbone set-up first seen at Mercedes and Toro Rosso last season. 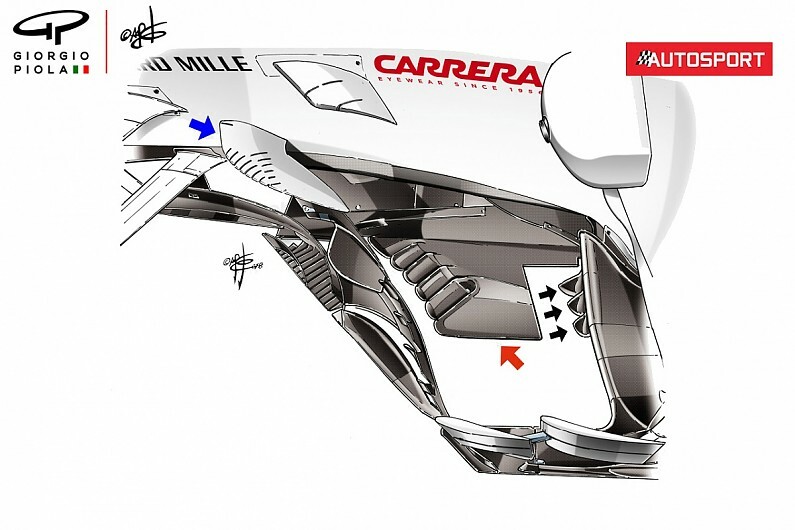 It has complemented it further with aerodynamic fences atop the wishbone (arrowed). In France, it was the turn of the brake ducts' vertical fence to get the winglet treatment (inset), with three small winglets mounted on the upper corner to try to drive more airflow out and around the tyre to reduce the turbulence created by the tyre alongside. The team also made several changes around the car's midriff as it looked to improve aerodynamic consistency and balance. 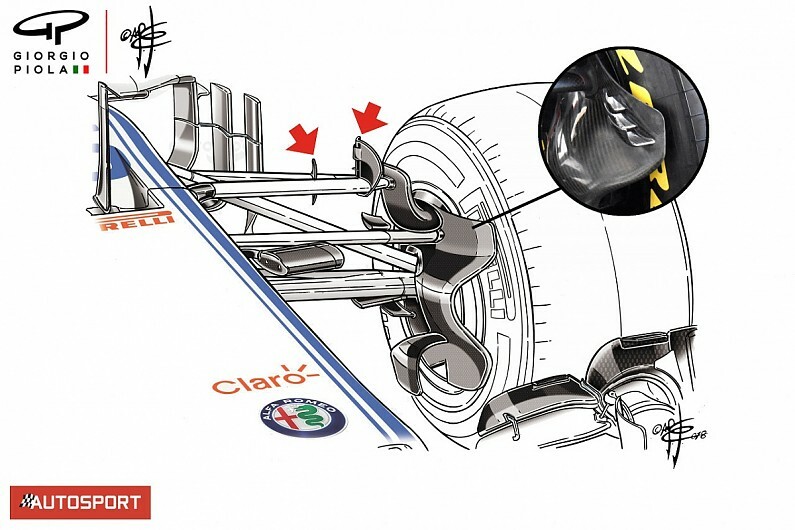 The chassis boomerang (blue arrow) was added as part of the Monaco update and helps to improve the direction of airflow around and into the sidepods. You'll note it has numerous holes in its surface - these run right through the item in order to mirror the slots in the bargeboard's footplate below for legality purposes. 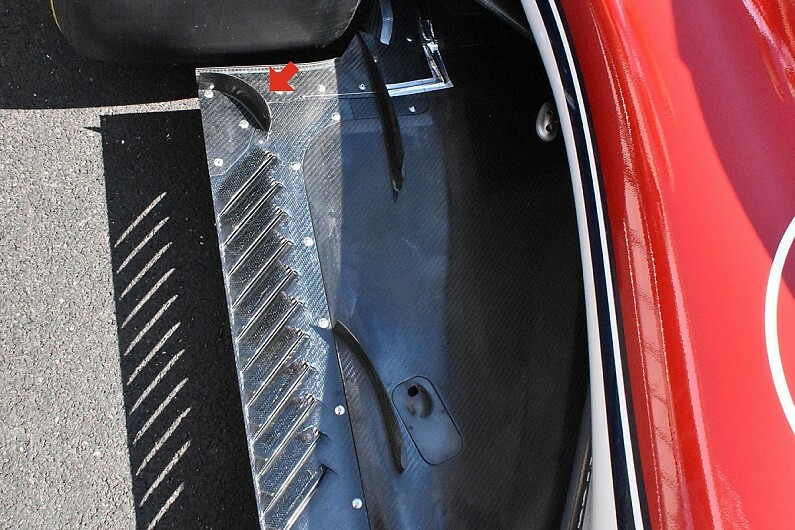 The triangular splitter extension (red arrow), which has become a dominant feature up and down the grid since the new regulations were introduced in 2017, was revised in France, as the shape and frequency of the slots were altered to improve its flow behaviour. 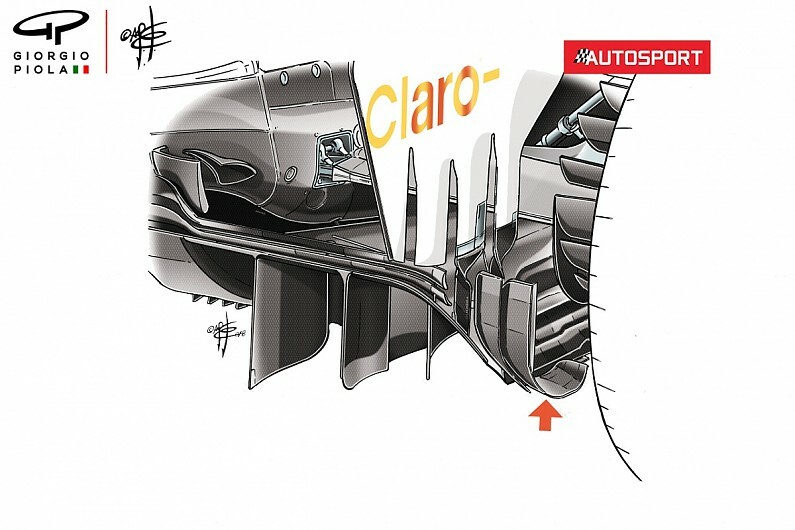 Behind this, the Sauber designers have joined the growing ranks of teams to use strakes on the leading edge of the upturned floor (black arrows). This helps to reduce the turbulence created ahead of them, lessening the impact it may have on the performance of the diffuser downstream. The floor ahead of the rear tyre has been an area of development for everyone over the last few years as the designers look to control the turbulence created by the rear tyre in order to improve the consistency of the diffuser. Various slots, strakes and holes are used in order to shape this turbulence, with teams often making changes based on revisions made upstream. Sauber opted for an aggressively curved strake ahead of the tyre as a way of tackling this turbulence in France (arrowed).